Isabel Wilkerson at the 2010 Texas Book Festival. 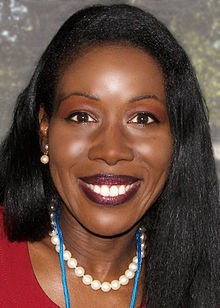 Isabel Wilkerson (born 1961) is an American journalist, and the author of The Warmth of Other Suns: The Epic Story of America's Great Migration. Born in Washington D.C. in 1961, she studied journalism at Howard University, becoming editor-in-chief of the college newspaper The Hilltop. During college, Wilkerson interned at many publications, including the Los Angeles Times and the Washington Post. In 1994, while Chicago bureau chief of The New York Times, she became the first woman of African-American heritage to win the Pulitzer Prize in journalism, winning the feature writing award for her coverage of the 1993 midwestern floods and her profile of a 10-year-old boy who was responsible for his four siblings. Several of Wilkerson's articles are included in the book Pulitzer Prize Feature Stories: America's Best Writing, 1979 - 2003, edited by David Garlock. Wilkerson has won a George S. Polk Award, a Guggenheim Fellowship, and a Journalist of the Year award from the National Association of Black Journalists (1994). She has also been the James M. Cox Professor of Journalism at Emory University, Ferris Professor of Journalism at Princeton University and the Kreeger-Wolf endowed lecturer at Northwestern University and Professor of Journalism and Director of Narrative Nonfiction at Boston University's College of Communication. She also served as a board member of the National Arts in Journalism Program at Columbia University. After fifteen years of research and writing, she published The Warmth of Other Suns: The Epic Story of America's Great Migration in 2010, which examines the three geographic routes that were commonly used by African Americans leaving the southern states between 1915 and the 1970s, illustrated through the personal stories of people who took those routes. During her research for the book, Wilkerson interviewed more than 1,000 people who made the migration from the South to Northern and Western cities. The book almost instantly hit number 5 on the New York Times Bestseller list for nonfiction and has since been included in lists of best books of 2010 by many reviewers, including The New York Times, The Los Angeles Times, The New Yorker, Amazon.com, Salon.com, The Washington Post, The Economist, Atlanta Magazine and The Daily Beast. In March 2011 the book won the National Book Critics Circle Award (Nonfiction). The book also won the Anisfield-Wolf Award  for Nonfiction, the Mark Lynton History Prize, the Sidney Hillman Book Prize, the Heartland Prize for Nonfiction and was also the nonfiction runner-up for the Dayton Literary Peace Prize in 2011. As of 2010, Wilkerson lived in the Virginia Highland neighborhood of Atlanta and, in a New York Times interview, remarked on being a part of a movement on the part of some African Americans to return to the South after generations in the North. 2011 Anisfield-Wolf Book Award, winner, The Warmth of Other Suns. ^ a b "Emory University Education Program". Emory University. Archived from the original on 2008-12-02. Retrieved 2008-06-18. ^ "30 Moments in Journalism". NABJ. Archived from the original on October 6, 2008. Retrieved 2008-06-18. ^ "First Born, Fast Grown: The Manful Life of Nicholas, 10 (April 4, 1993)" (PDF). New York Times. Retrieved 2008-06-18. ^ "List of Guggenheim Fellows". Guggenheim Memorial Foundation. Retrieved 2010-12-12. ^ "George Polk Award winners". Long Island University. Retrieved 2008-06-18. ^ "National Association of Black Journalists: Past Award winners". NABJ. Archived from the original on 2008-06-01. Retrieved 2008-06-18. ^ "Isabel Wilkerson, Director, Narrative Nonfiction Program". Boston University. Archived from the original on 2010-12-05. Retrieved 2010-12-12. ^ The Warmth of Other Suns: The Epic Story of America's Great Migration, Random House official website. ^ "Great Migration: The African-American Exodus North". National Public Radio. Retrieved 2010-12-12. ^ Teresa Weaver. "The Shelf: Top Ten of 2010". Atlanta Magazine. Archived from the original on 2010-12-06. Retrieved 2010-12-12. ^ Laura Miller. "The best nonfiction books of 2010". Salon.com. Retrieved 2010-12-12. ^ "A Year's Reading: Reviewers' favorites from 2010". The New Yorker. Retrieved 2010-12-12. ^ "Books of the Year: Page turners". The Economist. 2010-12-02. Retrieved 2010-12-12. ^ "Best nonfiction of 2010". The Washington Post. 2010-12-10. Retrieved 2010-12-12. ^ "The Best of the Best Books 2010". The Daily Beast. Retrieved 2010-12-12. ^ Charles McGrath, "A Writer’s Long Journey to Trace the Great Migration", New York Times, September 8, 2010. Isabel Wilkerson Tracks Exodus of Blacks from US South - video interview by Democracy Now! This page was last edited on 26 April 2018, at 18:45 (UTC).